A work born of the Great Depression, The Grapes of Wrath is surely one of the greatest, most powerful and important books in American literature. 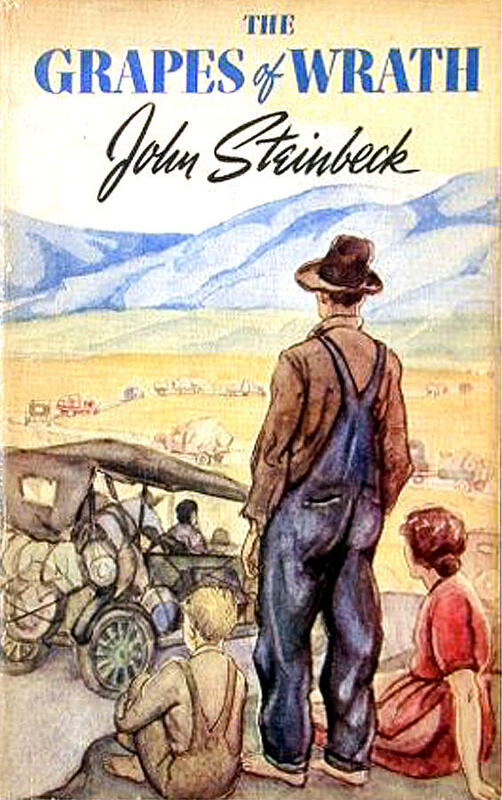 Focusing on a poor family of tenant farmers escaping the Dust Bowl of Oklahoma, Steinbeck set out with the express intention of shaming the people he held responsible for the plight of these losers of the Depression, and aimed quite simply to “rip a reader’s nerves to rags” with his tale. The Joad family sets out for California with their few remaining possessions, seeking work, land and new lives among the colourful orchards and vineyards of the western state, a veritable promised land. Instead they find further hardship, exploitation and abuse, labelled as ‘Okies’ and reds, welcome if they’re willing to work for a pittance, hounded should they try to make a living for themselves. Very reminiscent of Upton Sinclair’s The Jungle, it’s easy to understand why the book was rewarded with so many accolades, and its author with the Nobel Prize for Literature. What sets the book apart from Sinclair’s style is the directness of Steinbeck’s writing. The family is full of quirky and unique characters, entirely believable, if slightly monochrome in flavour. Other readers have complained the book is divided rather obliquely into the ‘good’ and the ‘bad’, and whilst they make a reasonable point, this neither detracts from the overall message of the novel, nor prevents those characters from acting as the real driving force of the story. The heroes of the novel are true salt of the earth, which gives the book openness and accessibility: that Steinbeck writes their dialogue in their vernacular is a powerful motif. Steinbeck intersperses his tale of the Joads with rather more artistic and morally or politically charged chapters covering the broader sweep of change facing America in the ’30s. In effect, the chapters intertwine the individual experiences of the Joad family with the macrocosmic overview of society in the Depression years. Steinbeck’s rather more loaded and overt statements appear in these segments, but he also allows his characters to speak for him, especially Tom Joad and the preacher. The Grapes of Wrath is entirely deserving of its accolades, and its place on countless lists of best novels or works to read before you die. Some reviewers had difficulty persevering past the book’s opening, others found the vernacular language distracting, but generally speaking this is an extremely accessible novel which doesn’t require a great deal of background knowledge to be appreciated.